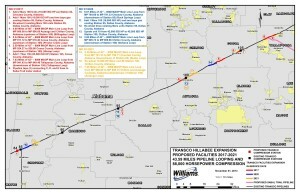 The Hillabee Project would also serve as a starting point for Sabal Trail Transmission’s project that will see a new compressor station and 500-mile long pipeline that would start near Brick Plant Road in Alexander City and end in Osceola County, Florida. And another compressor station in Albany, Dougherty County, Georgia, where opposition has caused Sabal Trail to tinker with the route, as it has also done in Hamilton County, Florida. You can join the opposition at the Open Houses in Albany, GA Monday and Jasper, FL Tuesday. Will the expanded Transco blow up like Transco already did in 2011, leaving a 50-foot crater and 65 acres of incinerated trees? Or maybe like Williams’ 2014-03-31 Plymouth, WA explosion, or its 2014-04-05 Marshall County, WV explostion, or its 2014-04-23 Opal, WY explosion, or its other earlier ones? 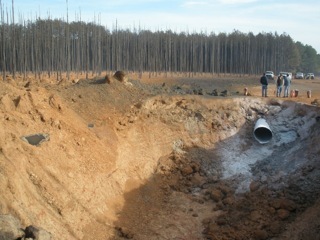 Or will Williams leave the corrosions, leaks, and explosions to Spectra and its Sabal Trail pipeline? Stockton said Williams Companies, which manages the pipeline, is currently preparing to file its application with FERC in November after six months of doing survey work and meeting with landowners, agencies and municipalities that lie within the corridor. Not many people showed up at the Alabama FERC Scoping Meetings, but if they had they would have been counted as tick marks towards “moving forwards”. How about we all move beyond that, and complain in ecomments to FERC, where everbody signed up will see them, to local, state, and national elected and appointed officials, and to the press? 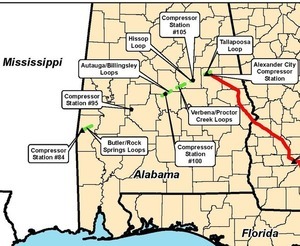 The Hillabee project calls for a new compressor station in Choctaw County, Alabama, and would also include a total of 9.9 miles of additional 42-inch pipe in Coosa County, and 7.6 miles of 42-inch pipe added to Tallapoosa County. Stockton said FERC’s review process usually takes about eight months, and that the Hillabee Project is the first of three phases set to begin in 2017. That’s the same Chris Stockton who is pushing the Atlantic Sunrise pipeline in Pennsyvlania that would feed fracked Marcellus shale gas to Transco, and then to Sabal Trail, which just happens to go through FPL’s FSC right to three already-authorized LNG export operations in Florida. Is profit for Williams, Spectra, and FPL reason for you to give up your land or the rest of us to have to pay for environmental destruction, hazards, and likely tax costs to clean up their messes, not to mention higher domestic natural gas prices if LNG export starts? No it’s not! Spectra’s Andrea Grover admitted in the same newspaper that Sabal Trail was no longer aiming at 31 October 2014 to file, rather “sometime later this year”. Opposition is slowing down this pipeline chain. Remember to FERC ecomment, contact your elected and appointed officials, write letters to the editor, call radio shows, etc. And Albany, Georgia isn’t all that far from Alexander City to come protest to Sabal Trail and FERC, maybe in front of national media. I am the Chairman of the Silver Lake Association Planning and Zoning Committee. Paul Emons is coordinating the infiomatorn for SLA. We are faced with nearly the same situation, and are in the early days of researching as we only discovered the situation last week. Land within the Silver Lake watershed is being taken by Eminent Domain for a compressor/pumping station placed within this resort community. Please keep us in the loop ! We too will push for Public Hearings.